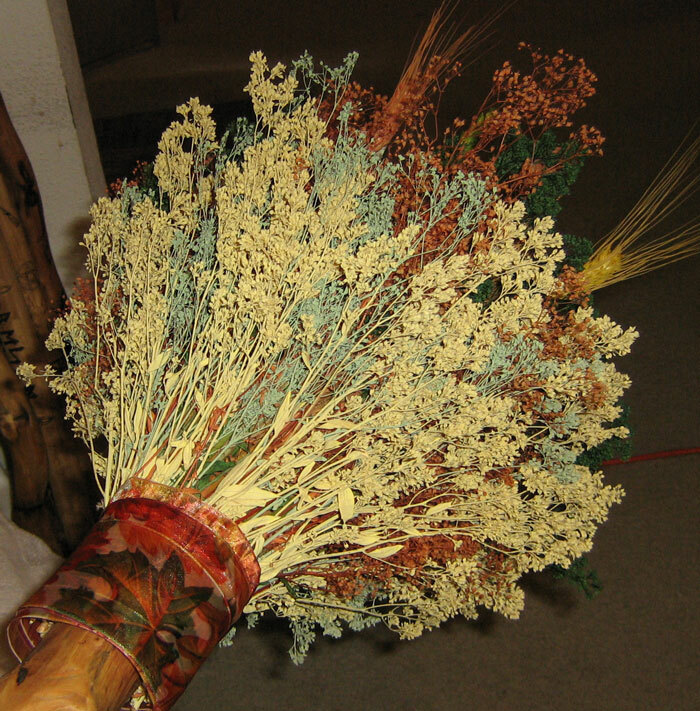 Custom Made Handfasting Broom (Besom) - July 14, 2006 - "Please tell me if you have any suggestions for flowers or colors. I don't see things in my head very well so I always appreaciate a little help. My wedding colors are sage green, citrine and ivory. Thanks so much." K. Graham, Lithonia, GA.
July 17, 2006 "Yes, citrine is in the orange family. It's an ambery orange type of color. I think the yellow sesame bloom would be just fine. If it helps, my favorite broom for sale on your site is the 68 1/2" Cottonwood broom. 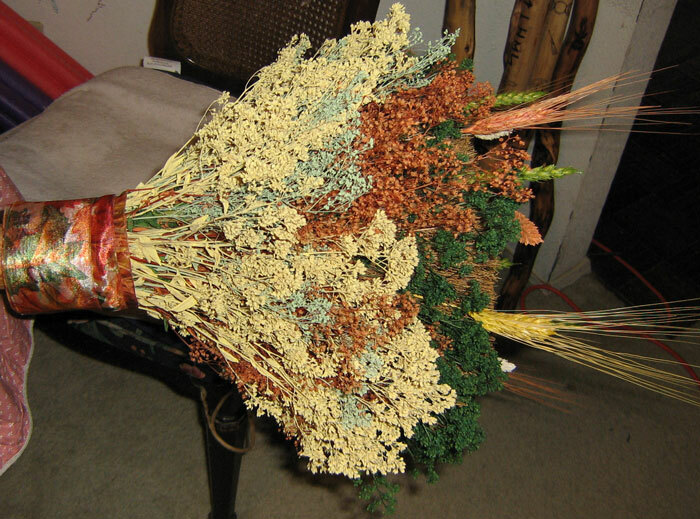 I think the colors are beautiful and I especially love the wheat in that broom. I love creator input and creativity as I am not very good at art and design myself. So if you have an idea, run with it cause I'm sure it will be beautiful. Thanks," K. Graham, Lithonia, GA.
July 19, 2006 "Thank you for the quote. I would very much like for you to do the broom. Pictures would be great. 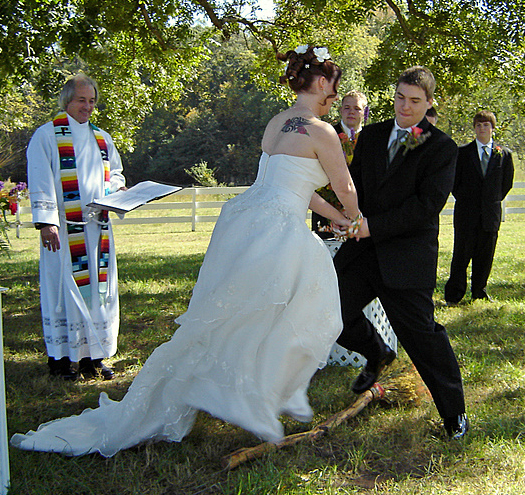 And I found you a while back by doing a search for "Handfasting Brooms" on google. I looked at a bunch of sites that didn't have what I was looking for and then I found yours. I can hardly wait to see it. Thanks," K. Graham, Lithonia, GA.
August 29, 2006 "Hi, Just wanted to see if you have any pictures yet of the broom. Hope you are doing well. Thanks," K. Graham, Lithonia, GA.
August 31, 2006 "I just wanted to let you know that I got the pictures and I love it! 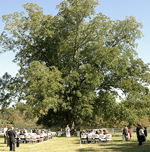 The colors come together beautifully and it is going to fit right into the wedding colors. I can't wait to have it in person, but mostly I can't wait to use it in the ceremony. I will send you plenty of pictures to choose from. Thank you so much for you time and creativity. Sincerely," K. Graham, Lithonia, GA.
May 20, 2007 "Thank you again so much for the beautiful broom that you made for my handfasting. The pictures that you sent me before hand do not do it justice. 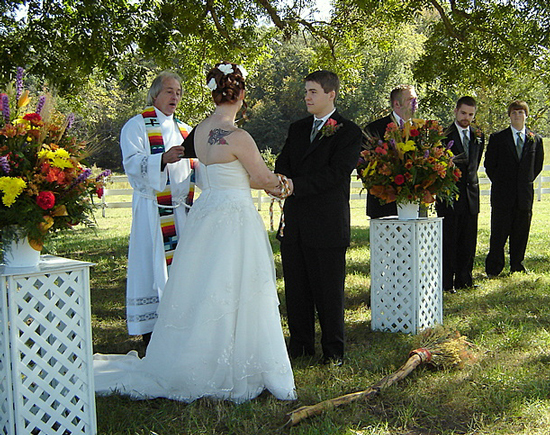 The ceremony went beautifully and I got many wonderful comments about the broom. It was a blessing to find you because I must have looked at a hundred websites trying to find a quality, hand-crafted broom and had zero luck until I found your website. I will most definitely refer you to everyone I know. For part of our wedding gift, my father hand-crafted a wooden shelf with brackets to hold our broom and it now hangs in our bedroom to always remind us of our love and commitment to one another. I have attached some pictures from the ceremony. 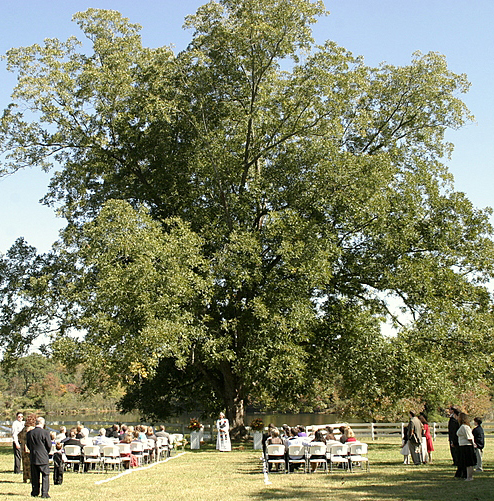 There should be one of us before we jumped the broom, one jumping it, and I threw in one of the awesome tree that we got married under. I like to think of it as the Tree of Life. I think it may be an Ash tree but I'm not certain. I hope you like them. Thanks so much." K. and B. Simpson, Lithonia, GA.